This coin is the UK legal tender, it’s reverse appears the Chinese character for “dog” and the inscription “Year of the Dog” , the year of mintage and the weight and fineness. The observe bears the effigy of Her Majesty the Queen Elizabeth. The mintage is limited to 138,888 coins. You can choose to take direct discreet delivery or elect to store your 1 oz Silver British Year of the Dog Coins safely and securely with Kitco Allocated Storage. 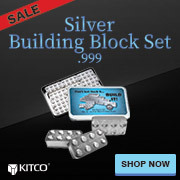 Why buy Silver British Year of the Dog Coins from Kitco? You can sell or buy Silver British Year of the Dog Coins and other precious metals using our convenient online store, or by contacting our team of highly trained precious metals specialists. Backed by our global information network, Kitco has been proudly serving our customers since 1977. The 1 oz Silver British Year of the Dog Coin(s) you receive may not be in absolute mint condition.